Tod's story races on in this second book in the TodHunter Moon trilogy, a spinoff of the popular Septimus Heap series. Fans of Septimus as well as fantasy readers new to the world of Magyk will enjoy this next installment in the series ALA Booklist calls 'warm and inventive.' Full-page illustrations by renowned fantasy artist Mark Zug begin each section and add to the magic! Great for readers of Harry Potter or Brandon Mull's Fablehaven series, TodHunter Moon offers something for every reader, regardless of gender or age. 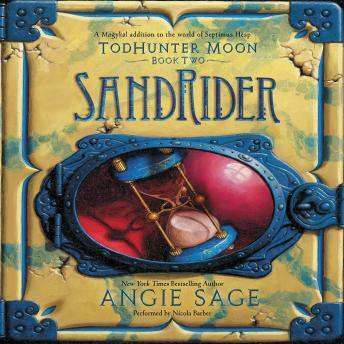 SandRider is also a dynamic pick for parents reading aloud to younger children before bedtime. Taking place seven years after the events of the original Septimus Heap series, TodHunter Moon tells the story of Alice TodHunter Moon, a young PathFinder who comes to the Castle with a Magyk all her own. In this second book, Tod sets out for the Desert of the Singing Sands to retrieve the Egg of the Orm—a journey that will test not only her Magykal and PathFinding skills but her friendships, too.